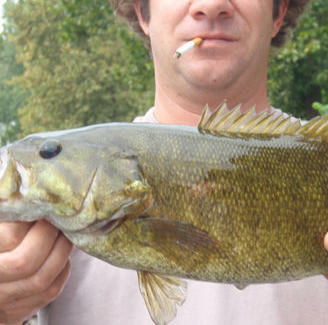 One-half of the seminal avant-pop duo and a "pretty good conversationalist", Dean Ween recently received his formal certification as a Captain and's using it to build on his Net-based Brownie Troop Fishing Show, hitting the high seas for loads of sport fishing and bringing aspiring bass-masters with him, though according to the site there're "No bananas on board the boat". 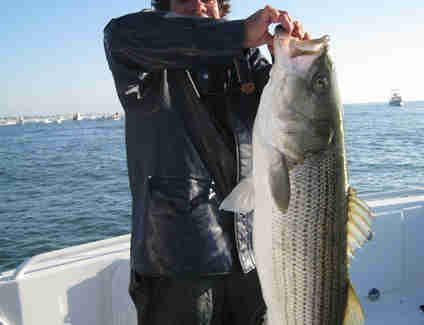 Offering two separate voyages out of his marina in Belmar, teams of two Ocean Men can hunt for migrating striped bass using "live lining bunker, casting topwater pencil poppers, swimmers, and jigs" from the deck of a 23ft Jones Brothers Cape Fisherman called the Archangel, a name so holy they must think they're poop deck doesn't stink. If you'd rather go big you can charter a 100 footer, necessary for overnight deep sea voyages and outfitted to accommodate "heavy drinking and eating for up to 50 people" should you want to throw a bach party or have the man himself preside over your nuptials, an event every man dreams of, as it guarantees he'll be even more constantly laid. Which is extremely possible.